Nurture a lifetime of good oral habits with proactive oral care. 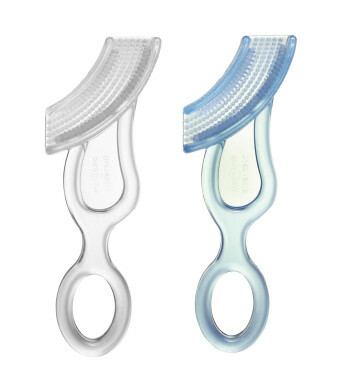 Our best-selling Baby Buddy item, Baby's 1st Toothbrush is designed for baby to hold and control. Stage 4 of a complete, 6-Stage Oral Care System, these innovative care products grow with your child from birth to age 12. The first 4 stages are designed to take care of budding baby teeth from the start with state of the art, safe and soft products that children love to chew on. Stages 5 and 6 progress to distinctive toothbrushes for ages 4 months to 12 years that easily clean those hard-to-reach places where food and plaque can build up and cause cavities and other oral problems. Use Stage 4 Baby's 1st Toothbrush every day to clean and massage tender gums. Children learn to enjoy brushing their teeth from an early age. Invented by a pediatric dentist, its innovative H-shaped design and silicone composition allows for children to clean teeth and gums as they chew. 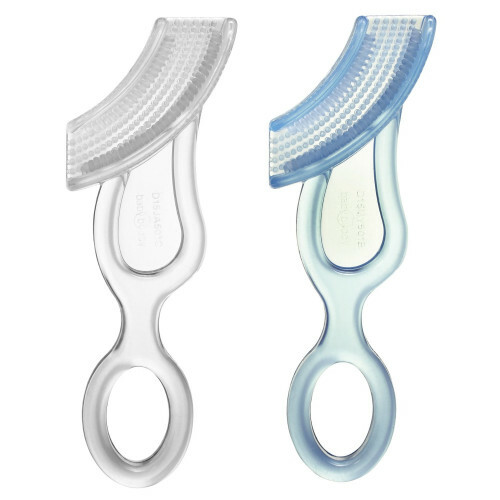 Moreover, Baby's 1st Toothbrush is great for teething and may be chilled in the freezer. Clean in the sterilizer or dishwasher. Children are used to hearing, Don't put that in your mouth. Baby's 1st Toothbrush fills a key role in the Baby Buddy Oral Care Program by giving children, as early as 4 months old, a little ownership and responsibility in their own oral care. Due to its silicone construction, parents and caretakers of crawlers and toddlers need not worry about a hard plastic handle and a fall. Give your child the gift of a lifetime of good oral care habits with the innovative Stage 4 Baby's 1st Toothbrush for children aged 4 months and older. Check out our other Baby Buddy products because Every Baby Needs a Buddy.